Seemingly more and more items that we consume and use in our everyday lives are tainted with harmful chemicals especially when it comes to beauty products, which are highly unregulated. In the name of “protecting formulas”, very little is disclosed about the composition of fragrances. With such a grim reality, where do you turn to for ethically sourced and chemical free scents that smell amazing? 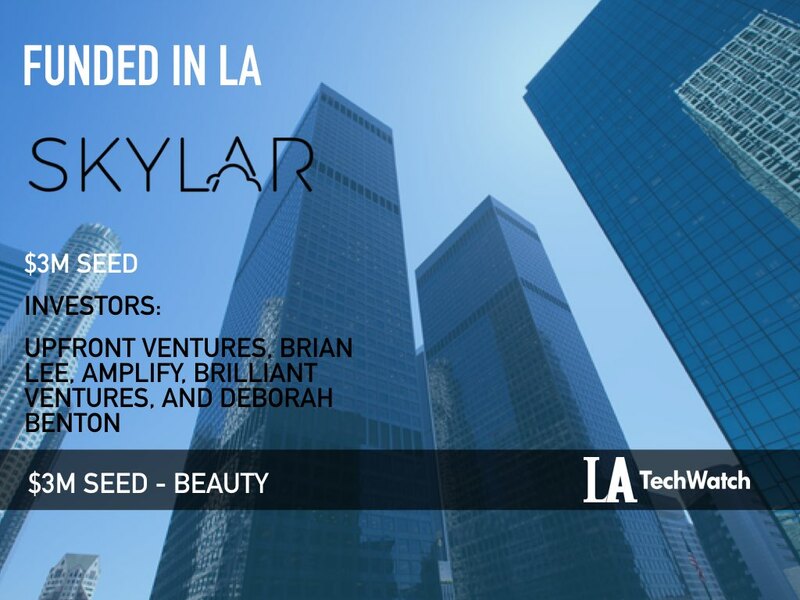 Introducing Skylar Body, the natural, hypoallergenic direct-to-consumer perfume company. Its online scent quiz finally moves perfume shopping into the 21st century while offering a product that is truly safe. LA TechWatch chatted with founder and CEO Cat Chen about the company, its origin, future plans, and recent seed funding round. We raised $3M in a Seed round led by Upfront Ventures (Partner is Kara Nortman). Other notable investors include Brian Lee (Founder of The Honest Company and LegalZoom), Amplify (LA’s biggest startup accelerator), Brilliant Ventures, and Deborah Benton (former President of NastyGal). We offer natural, hypoallergenic, and cruelty-free perfumes direct to consumers. Women. This company is made for women by women, to provide cleaner products for women and better information on these products. One of the women that inspired me to start Skylar is my daughter. She is allergenic to conventional fragrances (as are 15% of the women we spoke with), so I became very motivated to find a cleaner solution for scents. Conventional fragrances on the market, including designer fragrances, often trigger allergies, are scented with only synthetic ingredients, contain harmful chemicals, and test on animals. Skylar scents do not contain harmful ingredients or allergens. They’re also vegan and cruelty-free. Plus, we bring the sampling experience right to your door, so trying Skylar is much more convenient, personal, and fun. We’re currently targeting the fragrance market, which is $40B in size globally. We’re a digitally native brand and sell direct to consumers. We believe this is the best way for us to provide the highest level of customer service and information. How are you able to facilitate discovery and convey what a particular scent smells like when primarily distributing online? If you come to the Skylar site, you’ll get a very different experience than the traditional perfume shopping experience in department stores. We have an online scent quiz that generates recommendations for you. Our customer happiness team is on stand-by to help match your preferences to a scent and provide information on our products. Our customer reviews are also extremely detailed and helpful. And we offer a satisfaction guaranteed return policy, so there is no risk to give Skylar a try! 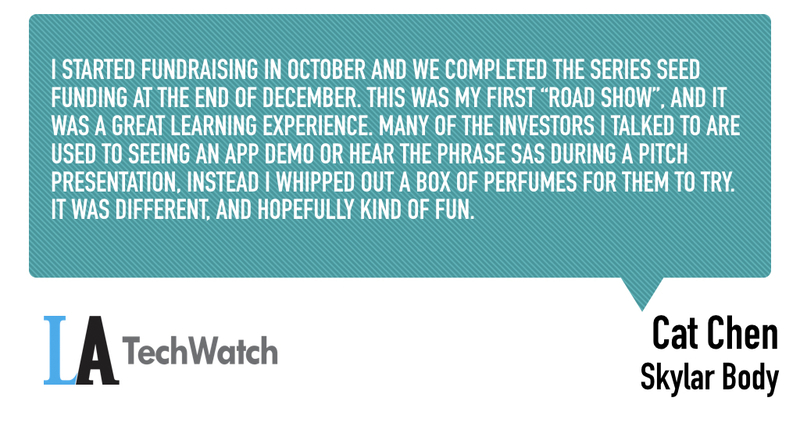 I started fundraising in October and we completed the series seed funding at the end of December. This was my first “road show”, and it was a great learning experience. Many of the investors I talked to are used to seeing an app demo or hear the phrase SAS during a pitch presentation, instead I whipped out a box of perfumes for them to try. It was different, and hopefully kind of fun. When I met with Kara Nortman at Upfront Ventures (LA’s largest VC), we immediately had a connection. Kara is smart, kind, and real. She’s so passionate and knowledgeable about consumer products, and she’s passionate about empowering women and women entrepreneurs. I’m excited to partner with her on the Skylar journey. Trying to convince investors that selling scents online is a thing and can be a big thing. The numbers spoke for themselves. We’re a new company, less than 9 months old, but our early traction is very promising. From traffic to conversion to customer satisfaction to community engagement, our metrics suggest we’re on the right path. Assemble a core team of rockstars to help grow the business, continue to develop innovative products that our customers have been requesting, engage and grow the Skylar community. Be scrappy and get to some numbers that you can show for ASAP. This means take advantage of contractors when you can’t afford full-time employees, doing things yourself, and using good and accessible tools and systems that are available on the market (like Shopify, for example). And once you have numbers to show, it’s much easier to get outside investment (if you need it). Continue following our mission by making clean scents a choice for more women everyday. What’s your favorite outdoor activity in LA? Hiking in Temescal Canyon. It used to be the go-to weekend activity for me and my husband, and we recently started taking my 3-year old daughter. She provides entertainment on our hikes by singing Moana songs non-stop.